The winning-most jockey in Festival history was hurt when he parted company with Al Boum Photo at the penultimate fence in the second race of the day, the RSA Insurance Novices' Chase. The 38-year-old rider only returned to competitive action last Thursday, after suffering his original injury at Punchestown on November 18. A statement issued by his sister and agent, Jennifer, said: "Unfortunately he has aggravated a recent leg injury and will see his consultant in Dublin next week for further assessment." 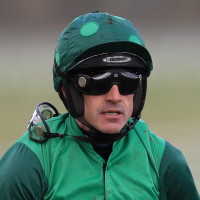 Davy Russell was stood down for the last two races after he suffered a fall in the Glenfarclas Chase. Russell, who won the RSA on Presenting Percy, was signed off when he parted company from the Gordon Elliott-trained Bless The Wings. The BHA's stewarding team tweeted: "Following a fall in the Glenfarclas Cross Country Chase, Davy Russell has been stood down for the day. "He would need to pass a further medical examination by doctors before taking any further rides at the Festival." Elliott said that Russell has suffered a knee injury, but expects him to be fit for the third day of the Festival.